Does Captain Byron Inman Haunt His Tug Record in Duluth Harbor? Great Lakes Winds in the Rigging.. Does Columbus Sail His Ships in Jackson Park Lagoon? Does Faithful Florence Martus Still Wave to Her Yankee Lover? Thomas Adams had already had many adventures in his life when he arrived in Detroit at age of 16. He was born in Western England in 1832, and left for Canada with his parents when he was 12 years old. While he lived in Canada, a relative of his who ran a distillery told him that if he stayed he would give Thomas an interest in the business. Thomas declined because he didn’t want to be identified with manufacturing liquor. Instead of manufacturing liquor and barely nudging age 16, Thomas came to Detroit in 1848, and found work at the foundry of DeGraff & Kendrick as a boat molder. The Detroit that Thomas became acquainted with had less than 20,000 people and at that time the Great Lakes shipping industry in Detroit was confined to the district between Third and Randolph Streets. Most of the boats landed at or near the foot of Randolph Street. Woodworth’s Steamboat Hotel, the headquarters for mariners in the early days, was located on Randolph Street near the wharfs. Shortly after the navigation season of 1848 opened on the Great Lakes, Captain H. Squier of the St. Joseph made a trip from Buffalo to Detroit in 29 hours and 45 minutes. A few short weeks after this noteworthy event, the St. Joseph made a more sinister mark on Detroit history. On May 9, 1848, the steamer St. Joseph laid moored at the foot of Randolph Street in front of a warehouse. A spark from her boiler landed on some dry wood and it caught fire. The fire spread and grew into a conflagration. The firefighting equipment consisted of the old style, hand operated pumps and every able-bodied person turned out to do a share of pumping. Mr. Kendrick told the men at the foundry that they could knock off work and go help fight the fire and Thomas Adams went with the rest of the men and spent hours fighting the flames. Several newspapers around the Great Lakes featured the story of the fire. In Wisconsin, the Milwaukee Daily Sentinel and Gazette reported on May 12 that the burned area covered about ten acres of ground and about 107 homes were burned along with bridges, shops, and stores. Major Biddle was counted among the heaviest sufferers, his loss being probably between $25,000 and $30,000. The Prairie Du Chien Patriot in Wisconsin said that the Great Detroit fire broke out about half past 11 on the morning of May 9, 1848 when sparks from the propeller St. Joseph which was lying in front ignited a large yellow warehouse between Randolph and Bates Streets. The fire burned from 11:00 a.m. to 3:00 p.m. Between 80 and 100 buildings were ashes, including two or three large warehouses on the Detroit River, the Steamboat Hotel, Water’s hotel and a number of private homes on Jefferson Avenue. The District burnt included about half a dozen blocks. Some damage estimates are as high as $300,000. About 200 families were burned out and nearly 1,000 people were hurried into the street. Several citizens were injured in the general scrabble, and one person was burned to death, while intoxicated and asleep near the Bethel Street Market. The large brick block that housed the Detroit Daily Advertiser Office was much damaged, but most of its equipment was saved. A public meeting was held on May 12, 1848 at the U.S. Court House Building, and several thousand dollars were promptly subscribed for the immediate relief of the destitute suffering. After the fire excitement and recovery abated, Thomas Adams and his friends often went outside Detroit to hunt. He shot wild pigeons on Hog Island, now Belle Isle, and on Peche island. The boys rowed to Peche Island and found very good shooting, especially on the Canadian side. Thomas eventually married. The 1860 census reveals that he had a wife name Mary and his father, Robert Adams lived with them. Thomas built the first dwelling house north of Michigan Avenue on the Jones farm and was the second man to lay stone walk on Michigan Avenue. 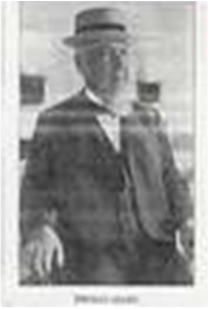 As early as 1868, Thomas Adams expanded his business interests from his boat molding work at De Graff & Kendrick to shipping and he joined Great Lakes tug captain and ship builder Robert Hackett. Captain Hackett was interested in tugs and built several fine vessels. Thomas Adams also bought an interest in the Forest Queen with Captain Hackett. Moses & Quayle shipbuilders at Ohio City, Ohio, built the Forest Queen in 1851. The Forest Queen was lost in December 1868 at Clay Banks, Pigeon Bay, Lake Erie, when she was cut by the ice and sank and Captain Hackett spent the mid-1880s and as late as 1887 looking for her with the tugs Shoo Fly and Challenge. After Captain Hackett’s death, Thomas Adams developed his independent shipping interests. In 1888, the F. Wheeler Shipyard at West Bay City, Michigan, built the Tom Adams which was renamed the Langham in mid-voyage in 1902. This abrupt name change caused much confusion among ship reporters, but Thomas Adams retained his judicious maritime judgment. The Langham was lost on Lake Superior on October 24, 1910, ironically for Thomas Adams, by fire. She was sheltering from a storm at Bete Grise Bay on the Keweenaw Peninsula when she caught fire, burned to the waterline and sank. She was a total loss. Besides owning the Langham, Thomas Adams was the president and the general manager of the companies that owned the George L. Craig and the Thomas Adams, the most modern coarse freight carries on the Great Lakes. Thomas Adams didn’t stray from maritime Detroit in his conversation. In a May 24, 1903, interview with the Detroit Free Press, he reminisced about the Detroit he had known as a 16-year-old boy. He remembered there once had been several creeks running through what was now Detroit dry land. May’s Creek had once ran along Eleventh Street and the city officials had built a sewer in the bed of this creek. Bloody Run, the scene of an early massacre, crossed Jefferson Avenue and a long, wooden bridge crossed it for many years. The Savoyard River once ran up what was then the alley between Congress and Larned Streets east of Woodward and emptied into the Detroit River. Thomas Adams said it was a shallow stream, but scows were floated up it for some distance. One of the most vivid memories of Thomas Adams of those early days in Detroit involves fish, whitefish to be exact. He recalled that fishermen brought fine, large whitefish to Detroit in those days and sold them at the rate of $2.50 per hundred count. If they couldn’t get the cash, they would trade the whitefish for whiskey and pork. Bolanda, George, Bak, Richard, Ciavola, Michelle. The Way It Was Glimpses of Detroit’s History from the Pages of Hour Detroit Magazine. Momentum Books, 2004. Gay, Cheri Y. Detroit Then and Now. Thunder bay Press, 2002. Mansfield, J.B., ed. The History of the Great Lakes, Volumes I and II. Chicago J.H. Beers & Co. 1899. 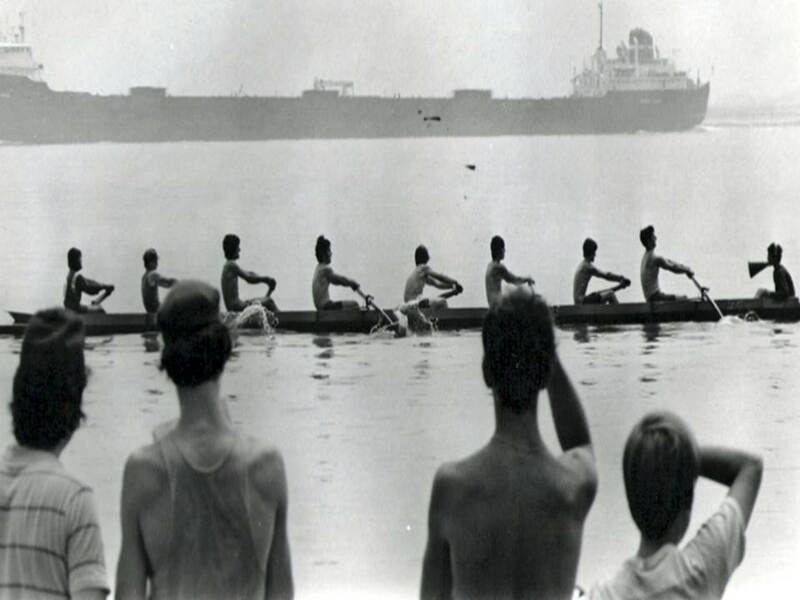 Photograph courtesy of the Ecorse, Michigan Rowing Club.